It is hard to open a paper or new website without being bombarded by news of the ails of many of the world’s leading economies. Most economists would agree that the costs of healthcare are amongst the highest. In order to maintain longevity and fiscal well-being, these costs are most in need of being addressed. Fortunately, focusing on health has become a growing trend for these economies. This is partly due to media making people aware of health risks associated with poor diets and inactivity, among others. Interestingly enough, technology and social media have also played a role. Welcome dacadoo! Dacadoo is the name of the award winning health platform from Switzerland. The idea for dacadoo came from Peter Ohnemus who was concerned with the fact that there was no way of tracking people’s health in real time and seeing the growing rates of obesity all around the world. Ohnemus thought that the answer was an interactive and fun way to track and improve our wellbeing. Together with a team of specialists, Ohnemus set about to create a platform that accurately depicts the user’s state of health. The platform works on many different levels to inspire its users to live healthier lives. Upon registration, users supply various pieces of health information to the platform which then starts to calculate a dacadoo Health Score of 1 - 1000. Not just a user’s physical activity and well-being are measured, but also their emotional and mental state (through a series of questionnaires). Users can even add information on their medical history, blood pressure and pulse, blood fats and blood sugar. This platform truly brings together most of your controllable health indicators. Another added bonus is that dacadoo works with a series of external measurement devices like smartphones and GPS watches for tracking distances and speed during activities, the Withings Scale for your weight, and heart rate monitors. Realizing that exclusively using your smartphone for tracking your health is a large drain on the battery, they have also enabled FitBit devices to track your daily steps (at least 10'000 being the goal). Visually displaying your health as well as providing a score is a great way of gamifying our health. In a 2010 TEDx talk, Seth Priebatsch talks about how gamification is the next step in technology and how it can be used for the better. Of course, gamification does not mean that social media is gone. It, too, remains an integral part of dacadoo and will continue to be an important technology. Gamification works on us as we want to maintain a high score. The higher the score, the healthier you are — quite a simple motivator. The algorithm behind dacadoo makes it harder for users to keep a high score. This means that one cannot simply do a week of regular sport and have a high score for a month if they stop. Health is lived. Setting goals is important to success, and dacadoo allows users to do just that. Finally, it provides visualized feedback on how close the user is to achieving their goals. When simply trying to keep your own score high for the sake of a high score gets boring, this is where the social network element comes in. See how your friends are doing: "John just did an 11 km run" - maybe I should get out there again, too. Or set up a challenge: "Who can bike the most kilometers this month?" You can improve your health with your friends and even strangers, motivating and challenging each another along the way. Achieving new milestones in workout distance and time is recognized by dacadoo, which in turn provides valuable feedback to keep up the motivation. 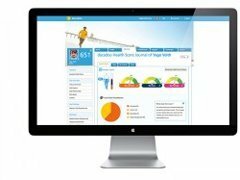 Since the launch of dacadoo (previously QUENTIQ) in December 2011, the platform has won numerous awards like the Health Media Award 2012 in Cologne, Germany, or a bronze medal for the "Best of Swiss Web Awards 2012". It has now been nominated for the "Best Swiss App Award". Others have clearly discovered dacadoo before I did. I have been using dacadoo for a little over a month now and am very impressed with the full range of health indicators it takes into account — the most of any fitness tracking system I have used to date. One thing I would like to see is a cross-platform import feature, so that I do not lose all the runs I have logged on other platforms. At the moment, dacadoo allows for users to import single workouts over the GPX file standard. Having been tracking my workouts for three years now, I can attest to the health benefits of being aware of your progress. Last year, I ran 2500 km, and this year I have set a goal of 3000 km. I am already 500 km into that goal and am still motivated, thanks in part to dacadoo. At present, dacadoo is free for 60 days. After that, there are different subscription options for users. I personally think that the ability to monitor my health is worth investing in. Some others may find the challenges, in which prizes including cash can be won to be the bigger motivator.